Stymulacja rdzenia kręgowego jest jednym ze sposobów leczenia chorych cierpiących z powodu nasilonych przewlekłych bólów neuropatycznych. Celem pracy było przedstawienie przypadku 38-letniego mężczyzny cierpiącego z powodu bólów neuropatycznych spowodowanych przez nieoperacyjny rozległy nerwiak kanału kręgowego w odcinku lędźwiowo-krzyżowym kręgosłupa, leczonego metodą neurostymulacji rdzenia kręgowego. Opisujemy przypadek chorego z przewlekłymi, ciągłymi, kłującymi i palącymi bólami prawej kończyny dolnej, promieniującymi od pośladka do podeszwy stopy wzdłuż jej tylno-bocznej powierzchni. Leczenie farmakologiczne bólu okazało się nieskuteczne i nie było akceptowane przez pacjenta ze względu na działania uboczne. Natężenie bólu, stan czynnościowy i psychologiczna odpowiedź na ból oceniono przy użyciu skali wizualno-analogowej (VAS), kwestionariusza Oswestry i kwestionariusza oceny bólu McGilla. Wyjściowe nasilenie bólu w skali wizualno-analogowej wynosiło 6, stan czynnościowy w skali Oswestry wynosił 40%, w skali oceny bólu McGilla chory uzyskał 40 punktów. U pacjenta implantowano stymulator przeciwbólowy Prime Advanced model 37702 i 16-kontaktową elektrodę chirurgiczną (Medtronic Inc, Mineapolis, USA). Wykonano laminektomię na poziomie Th10 i umieszczono elektrodę w linii pośrodkowej na worku oponowym. Ocena po 6 miesiącach wykazała redukcję bólu w skali VAS do 1, według kwestionariusza Oswestry wynik wynosił 20%, w skali McGilla – 20. W przypadku nieoperacyjnego, niezłośliwego nerwiaka położonego w kanale kręgowym stymulacja rdzeniowa okazała się skuteczną metodą leczenia przewlekłego bólu. Spinal cord stimulation (SCS) is one of the methods used as a therapy for patients suffering from intractable chronic neuropathic pain. The aim of the study was to describe a case of 38-year-old man suffering from neuropathic pain caused by inoperable lumbosacral intradural tumour (neurinoma) treated successfully using SCS. We described a patient with chronic, spontaneous, continuous, stinging and burning pain in his right leg radiating from buttock to posterior and lateral surface of the thigh, calf and sole. Pharmacologic treatment of pain was ineffective and not accepted by the patient because of its side effects. Patient’s pain intensity, functional status and psychological response to pain were assessed using the pain Visual Analog Scale (VAS), Oswestry Disability Index (ODI), Short-form McGill Pain Questionnaire (SF-MPQ). His initial VAS score was 6, ODI was 40%, SF-MPQ score was 40. In this case there was a SCS device Prime-Advanced model 37702 equipped with 16-contact electrode model (Medtronic Inc, Minneapolis, USA) used. After open laminectomy electrode was placed in the midline on dural sac at level Th10. After 6 months of the follow up VAS score was reduced to 1 in right leg, ODI score to 20% and SF-MPQ score to 20. In case of inoperable non-malignant neurinoma localised in the spinal canal, SCS seems to be an effective method of treating chronic pain. 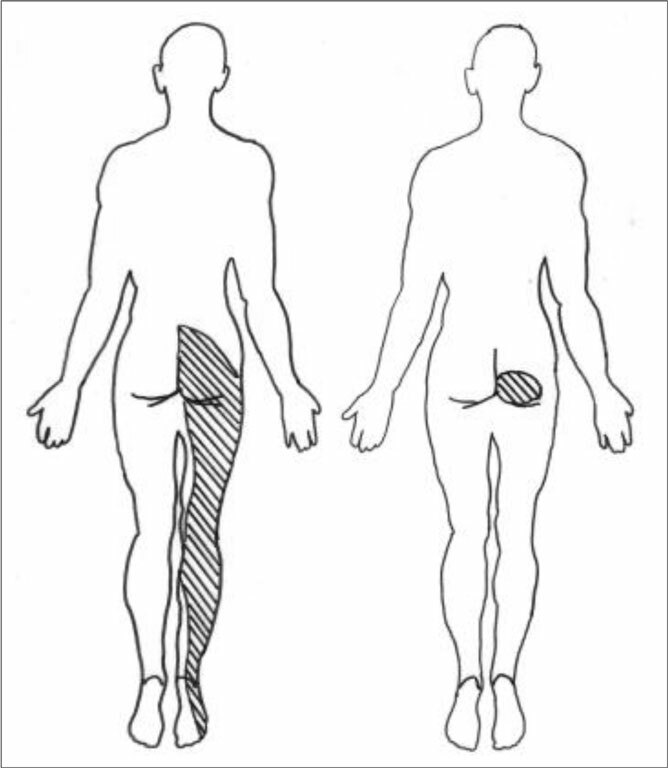 In 1965 Melzack and Wall (1) published their revolutionary theory of pain called the “gate theory”, which is nowadays thought to be a key to understanding function of the spinal cord stimulation (SCS). SCS was first described by Shealy et al. (2) in 1967 and it has been used as a therapy for patients suffering from intractable chronic neuropathic pain since then. For patients with chronic pain SCS represents many advantages, such as high effectiveness, minimal invasiveness and low complication rate. For these reasons this technique is the most widely used kind of neurostimulation. Nowadays there are about 12,000 of these operations per year performed worldwide (3, 4). Although the first case of administering treatment with SCS in the spine concerned a patient with a metastasis to the spine, until now descriptions of treating cancer pain with SCS are rare in the literature (5). In this publication an effective use of the SCS in case of a young man with inoperable benign neurinoma in the lumbosacral part of the spine is presented. 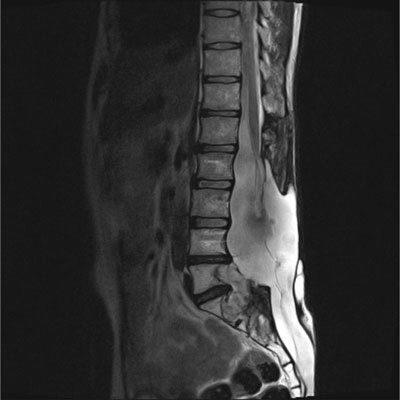 A 38-year-old man had a 7-year lumbosacral intradural (L3-S3) tumour history. The MRI showed large intradural tumour at the level from L5 to S4 with dimensions of 64 x 32 x 81 mm (fig. 1). In our department he had a decompressive laminectomy L2-S5 with dural sac reconstruction, repeated partial tumour removal and transpedicular fixation of L2-3-4-5 to bilateral iliac crests performed. Second operation in our department was performed in order to remove the tumour from the sacral canal. It turned out that the tumour surrounded nerve radices and, as a result, attempts to remove the tumour caused damaging the roots. That is why after this operation there were right foot paralysis and urinary disorders observed. Tumour histopathology was neurinoma G2. During disease course patient had episodes of transient pain relief, but there were some progressing neurologic deficits observed. Therefore, no further surgical treatment was taken into consideration. During the stay at our department, the patient had chronic, spontaneous, continuous, stinging and burning pain in his right leg. 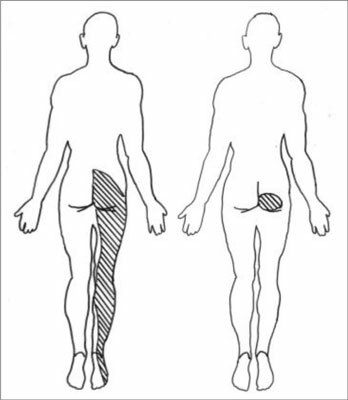 Pain radiated from buttock to posterior and lateral surface of the thigh, calf and sole. It aggravated during walking and right leg flexion. The patient suffered from paresthesia and hyperesthesia of the right leg. There was no difference of temperature, skin color, oedema and sweat between the legs observed. There was muscular atrophy of the left leg observed. The patient had his left foot dropping, the right Achilles and knee reflexes were absent. He had urinary retention. Since 2008 he had been catheterizing the bladder on his own. During the treatment with painkillers he had been doing it 8-10 times a day and urinated 100-150 ml. The patient had been regularly taking painkillers. At first he had taken tramadol and paracetamol in increasing doses. He could not reach the improvement of his state. He had received fentanyl transdermally. He had become numb, he had been spending most of his time lying, he had lost his interests, instead of going to work he had been staying at home, he had been feeling depressed. Because of the treatment he had been suffering from insomnia. He had not accepted this treatment. His pain intensity, functional status and psychological response to pain were assessed using the pain Visual Analog Scale (VAS), Oswestry Disability Index (ODI), Short- -form McGill Pain Questionnaire (SF-MPQ) (6, 7). His initial VAS score was 6, ODI was 40%, SF-MPQ score was 40. In this case there was a SCS device Prime-Advanced model 37702 equipped with 16-contact electrode model (Medtronic Inc, Minneapolis, USA) used. An open laminectomy Th10 was performed. The electrode was placed in the midline on dural sac at level Th9-10. The electrode placement was controlled with C-arm fluoroscopy. Lower margin of the electrode was at level Th10 (pulse width 330 μs, pulse rate 60 Hz and amplitude 1.5 V). Trial stimulation covered the right buttock, thigh, calf and sole. SCS-induced paresthesia covering the painful areas turned out to be sufficient. After 6 months of the follow up his VAS score was 1 in right leg. His functional status and SCS effectiveness evaluated with ODI was reduced from 40 to 20% and SF-MPQ score from 40 to 20. Although he had still some pain on the medial part of the right buttock, he was very satisfied with the stimulation result. Figure 2 represents pain reduction results. After the implantation of the SCS and cessation of taking drugs he has been catheterizing himself 6-8 times a day, urinating 300-450 ml. Stimulation is on during the day, at night it is kept turned off. The patient has a part-time job now. Spinal neurogenic tumours constitute from 25 to 30% of all intraspinal masses. However, spinal schwannoma arising from the sheath of the spinal nerve roots is very rarely seen in the sacral region. This kind of tumour grows slowly. Nevertheless, many surgeons do not operate tumours in this localisation. This operation is technically demanding, there are many vital anatomic structures nearby. For this reason resections may be incomplete and as a result recurrences of tumour are observed (8). Surgical treatment of our patient led to the complications: he developed leg paresis and voiding disorders. Pain that occurred after the operation the patient found hard to bear. He did not give his consent to be treated surgically again. Although he was taking analgesics and anti-inflammatory drugs, they turned out to be insufficiently effective. Narcotic drugs were not acceptable for a longer period of time, because the patient did not agree for their side effects, which could affect his life and work activity. After the implantation of SCS the patient was satisfied with its analgesic effects. He stopped taking narcotic painkillers and returned to his work career. In summary, in case of inoperable non-malignant neurinoma localised in the spinal canal, SCS seems to be an effective method of treating chronic pain (9). 1. Melzack R, Wall PD: Pain mechanisms: a new theory. Science 1965; 150: 971-979. 2. Shealy CN, Mortimer JT, Reswick JB: Electrical inhibition of pain by stimulation of the dorsal columns: a preliminary report. Anesth Analg 1967; 46: 489-491. 3. Meyerson BA: Neurosurgical approaches to pain treatment. Acta Anaesthesiol Scand 2001; 45: 1108-1113. 4. Gybels J, Erdine S, Maeyaert J et al. : Neuromodulation of pain. A consensus statement prepared in Brussels 16-18. January 1998 by the following task force of the European Federation of IASP Chaters (EFIC). Eur J Pain 1998; 2: 203-209. 5. Flagg A, McGreevy K, Williams K: Spinal cord stimulation in the treatment of cancer – related pain: “back to the origins”. Curr Pain Headache Rep 2012; 16: 343-349. 6. Fairbank JCT, Pynsent PB: The Oswestry Disability Index. Spine 2000; 25: 2940-2953. 7. Melzack R: The McGill pain questionnaire: from description to measurement. Anesthesiology 2005; 103: 199-202. 8. Klimo P, Rao G, Schmidt RH, Schmidt MH: Nerve sheath tumors involving the sacrum. Case report and classification scheme. Neurosurg Focus 2003; 15: E12. 9. Yakovlew AE, Ellias Y: Spinal cord stimulation as a treatment option for intractable neuropathic cancer pain. Clin Med Res 2008; 6: 103-106.